The fishing world watched as invasive Asian carp spread up the Mississippi River, negatively impacting fisheries along the way. 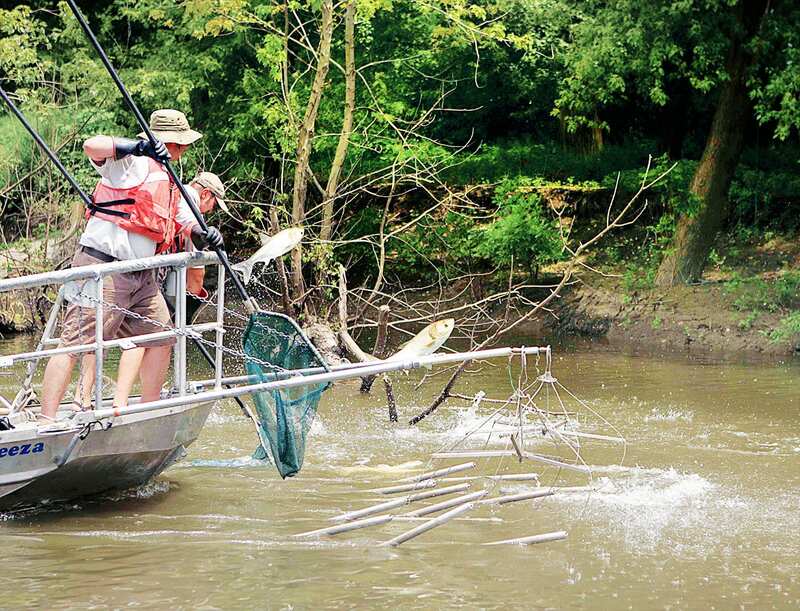 Now those same carp have become a major concern in the Tennessee and Cumberland rivers and many other rivers within the Mississippi River basin. In western Kentucky, two of the state’s largest reservoirs, Kentucky Lake and Lake Barkley, were formed by the construction of navigation dams on the Tennessee and Cumberland rivers, respectively. The lock systems of these dams are the primary sources of reservoir access for the invasive fish. Asian carp also continue to expand their ranges up many river systems throughout the Mississippi River and Ohio River basins. In response to the looming threat of invasions, several federal and state agencies and universities are working together to test a sound and air bubble system (bio-acoustic fish fence) that could be installed below lock chambers to deter fish passage. These systems have not been tested on Asian carp below dams, and the research is needed to assess the technology’s efficiency at reducing fish movement beyond the system. Bio-acoustic fish fence (BAFF) technology was invented and has been used in Europe, by the United Kingdom company, Fish Guidance Systems, LTD (FGS). This company’s technology has been chosen for testing in the downstream approach to the lock chamber at Barkley Dam in Kentucky. The Nashville District and Research and Development Center (ERDC) of the U.S. Army Corps of Engineers (USACE), U.S. Geological Survey, the U.S. Fish and Wildlife Service, U.S. Environmental Protection Agency, University of Minnesota, FGS, Tennessee Wildlife Resources Agency and Kentucky Department of Fish and Wildlife Resources are combining funding, technology or staff to construct a research plan that should put a BAFF system in the downstream approach to the lock chamber in early 2019. The extent of Asian carp movement from the tailwater into the reservoir will be assessed using multiple techniques including an existing and expanding telemetry receiver array. Tests for the BAFF were initially projected to begin this month; however, significant structural modifications will be required to protect the BAFF from large, heavy debris that would be pushed or pulled through the lock chambers, delaying the project until early 2019. The BAFF will be deployed in the downstream approach of the Barkley lock chamber. The additional time until deployment will also allow for various aquatic community samples to be taken and assessed to satisfy permit requirements for all projects that may affect the biota or the USACE’s operational procedures for recreational and commercial passage through the locks.